EVTO automatically kicks into high gear when you supply a trip’s starting and ending points: It selects a route, identifies charging stops, and displays the recommended route. Sometimes, you have a specific scenic route in mind, or a preference for particular points of interest. This tutorial explores two different approaches to route planning using Auto and Manual. Note: EVTO uses parameters specified in Settings and My Cars to improve the accuracy of its predictions. If your numbers don’t match ours, that’s probably because you have a newer car with cooler features. When EVTO is initially installed, Auto is the default choice. Auto means EVTO will automatically select a route from your origin to your destination, seeking optimal charging stops, based on vehicle characteristics and predicted weather conditions at the specified departure time. Your most recent waypoint charger selection, Auto or Manual, is remembered the next time you create a new trip. Select New Trip from the main menu. Origin: We’ll launch from Tesla HQ: 45500 Fremont, selecting the Fremont CA result from the displayed list of destinations. Destination: Enter Northstar, then select Northstar California Resort from the displayed list of destinations. Waypoint Charger Selection: Select Auto. EVTO calculates our route with an automatically suggested supercharging stop midway. That’s it – all that’s left is the driving! Enjoy your day shredding the slopes! 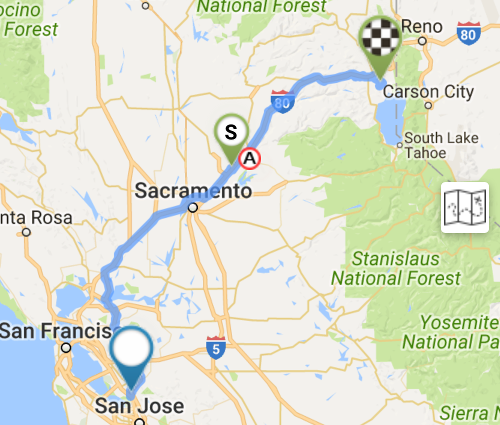 The return trip is easy as can be, with two nearby superchargers. To include specific stops on the way to our destination, we’ll use EVTO’s Manual mode. Today, our snowboarding friend Bob from Roseville will be joining us. Bob always likes to stop at Rocklin’s MOOYAH Burgers because, well, just because. After specifying our origin and destination, we’ll add two waypoints and a charging stop. Origin: We’ll depart from Tesla HQ: 45500 Fremont, then select the Fremont CA result from the displayed list of destinations. Waypoint Charger Selection: Select Manual. This time, EVTO calculates our route without any charging stops. EVTO is urgently calling our attention to an impending electron shortage by displaying a red destination pin. No worries. We’ll add our manual waypoints, then take care of any required charging stops. From the menu, select Add Waypoint. Enter Roseville CA in the name field, then select Roseville, CA from the displayed list of results. Bob prefers that we not know his actual address, but that’s another story. So we meet him in downtown Roseville. Bob’s never ready on time, so let’s add 20 minutes for Minimum Stop Time. Touch Save to add Roseville as a waypoint. Just in case we forget why we’re stopping in Roseville, let’s rename the waypoint to Pick up Bob. Touch the Roseville pin to open the Waypoint Inspector, then touch the pencil icon to open the Edit Waypoint dialog. Clear the name field at the top, then enter Pick up Bob. Touch Save to close the dialog. Next, let’s add Mooyah Burgers. For Bob. Sigh. Enter Mooyah Burgers Rocklin in the name field, then select the MOOYAH Burgers, Fries & Shakes, Commons Drive, Rocklin CA from the displayed list of results. Experience dictates that I should allow about 30 minutes for Bob’s flirting with Rosie, about 20 minutes longer than I need to finish my Reese’s® PB Cups Mint Chocolate Chip Shake. Dial in 30 minutes for Minimum Stop Time. Touch Save to update our itinerary. Now we have an origin, two waypoints and a destination, but no planned charging stops. Touch the lighting bolt button (lower right) to add the Tesla Superchargers overlay to the map. Zoom in on the Roseville – Rocklin area until two individual charger locations are displayed. Touch the southernmost S pin, between Roseville and Rocklin, to open the Charger Inspector. 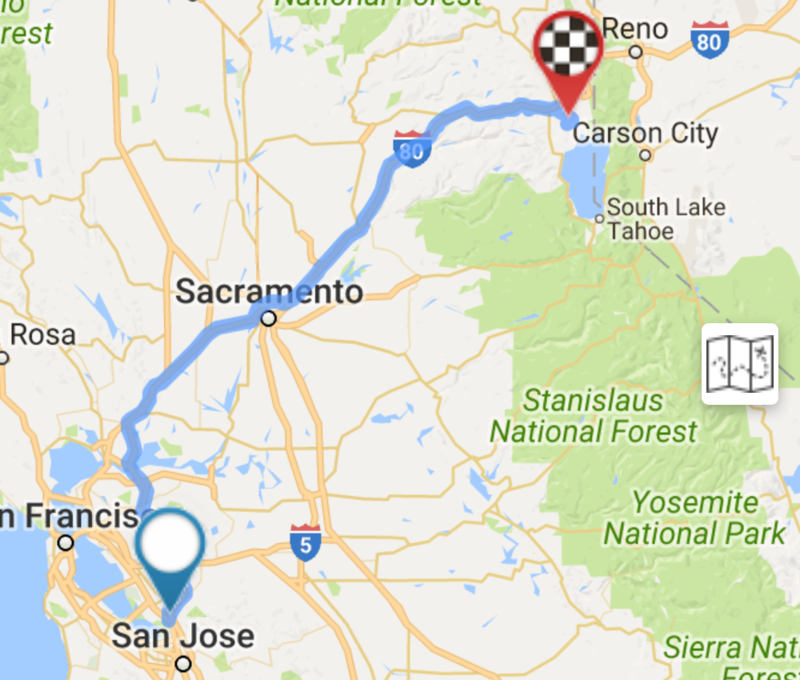 Touch the pin button to add the Roseville Supercharger to our itinerary. 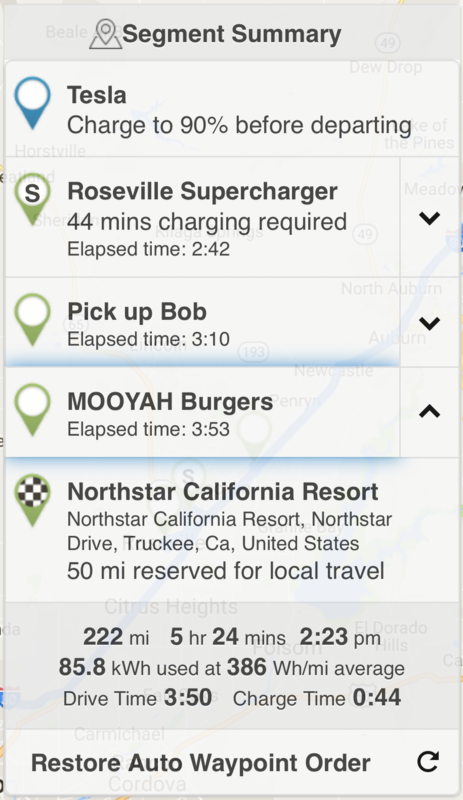 EVTO added the Roseville charging stop after the Pick up Bob stop, but I’d rather charge before picking up Bob. If you knew Bob, I’m sure you would agree. From the menu, select Segment Summary to display our itinerary. Touch and hold the downward arrow at right edge of Pick up Bob to move it below the Roseville Supercharger stop. Touch the circular arrow to the right of Calculate New Routing to apply the new waypoint ordering. Touch outside the Segment Inspector to dismiss the itinerary. Finally, let’s tell EVTO to reserve some energy for local driving in the North Lake Tahoe area. From the menu, select Edit Segment Details. In the Destination Reserve field, enter 50 miles. Touch Save to close the dialog and recalculate the route. Finally, select Segment Summary from the menu to display our itinerary. You’re planning a simple origin to destination trip, and you don’t care about where you stop – you just want the quickest route. You want to impress your non-EV-owning friends with how EVTO makes it easy to quickly stare down range anxiety. You’re planning a trip with specific stops or routing. You’d prefer to select your own charging stops. You promised Bob you’d take him snowboarding, and you wouldn’t mind a MOOYAH burger. If you do stop into the Rocklin MOOYAH, please tell Rosie that Bob sends his regards… then be prepared for an earful.